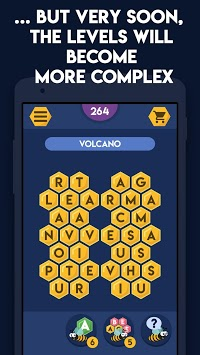 "Word Search - Word games for free" game is the fusion of the best features among the games of this genre. You will have to find words hidden on the game board. 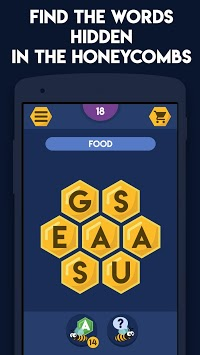 The word game has a bee theme, and the game board with letters is reminiscent of beehive honeycombs. There will be a total of 390 levels and 12 types of difficulty levels. In the start window, you can track the progress of the game and find out what kind of challenging quests are awaiting you in the near future. The easiest level consists of 4 letters, and the most complex one - of 38. 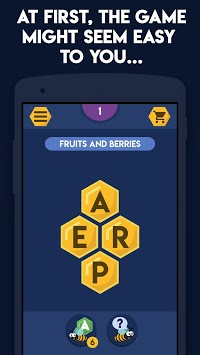 Find all the words that are hidden in the levels of this educational game. - for buying hint packs in the store. - player stats, how many people passed this level. When you connect your account to one of the two types of social networks, you will be able to invite your friends via a special menu. In addition, your social network avatar will be used in the player rankings, which will allow you to stand out among all other participants. The game is free and it contains advertising that is disabled after any in-game purchase is made. We fixed Facebook connection and added 50 new levels (total 390 levels).